I made these blondies late last week and boy, were they tasty! I’m so lovin’ pumpkin and peanut butter cups together. It’s too bad pumpkin ale is seasonal. If they were year-round, I’d get them all the time. The peanut butter cups were an afterthought. Since I had them hanging around my pantry, I thought I’d throw them in. These babies went quickly! I’ll be doing more baking today so I have something to serve with coffee/tea when my mother-in-law and her fiancé arrive. Enjoy your week! In a medium bowl, whisk together butter, sugar, egg and pumpkin ale together; set aside. Using a stand or electric mixer (or mix by hand) combine flour, baking powder, pumpkin pie spice and salt. Slowly pour the butter/ale mixture into the flour mixture and continue to mix until just moistened, scraping down the sides of the bowl. Scrape batter into the prepared pan. Using a spatula, distribute the batter evenly around the pan. Arrange the peanut butter cups over the batter. Bake for 27-30 minutes or until toothpick/tester inserted into the center comes out clean. Let the blondies cool in the pan on the cooling rack completely before serving. wow ale and peanut butter cups…those pumpkin bars must be heavenly, Anne. Hahaha, these pictures are great! They remind me that Halloween is coming, and then my two favorite holidays: Thanksgiving and Christmas! Can’t get enough of it. These blondies were a big hit at the office. I love anything pumpkin, and the pumpkin ale actually had some pretty good pumpkin flavor in it, but then the pumpkin spice gave it a little pumpkin bump (a bumpkin?). Oh Anne! How fabulous are those? Pumpkin ale? I don’t think I’ve ever come across that. Will have to search that out. LOVE those little PB cups popping out here and there! Oh, I just had to Pin this to my favourite recipes board! Genius! I can’t wait to try making these. They look SO good! 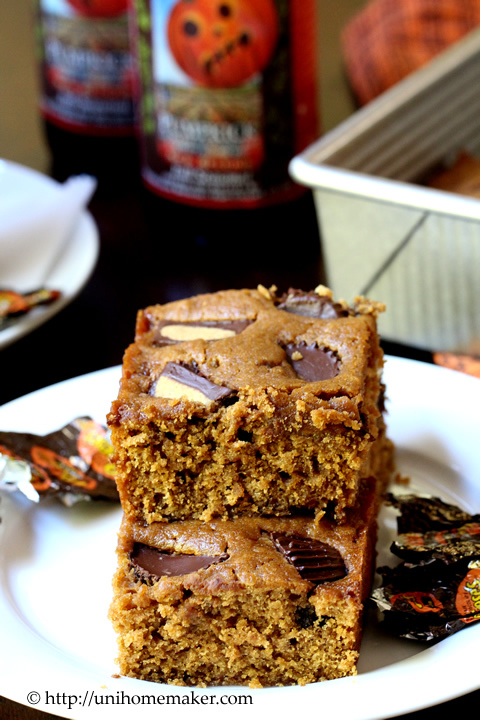 I have never seen pumpkin ale at the grocer, but it sounds delicious….and these blondies…to die for! Oh, my. What an amazing combination of flavors! The bars look so moist and delicious…then adding big chunks of pb cups can only make them more incredible!!! I love the combination of pumpkin and peanut butter too, it doesn’t get much better! Love that you added pumpkin ale too- so fun! Oh boy . . . pumpkin and peanut butter, what a combination! Bet these were gone in no time! Great pics, Anne! Oh goodness, you just won my heart like crazy! Loving these blondies! What a fantastic idea. Does the ale do something to the texture or does it mostly add flavor? Wow, Anne! I love blondies, an this flavor combination sounds perfect for fall! Have a great visit with your mother in law. Now I know what to serve for Oktoberfest! These remind me of all the best things about Fall and Halloween – the treats!! Your blondies look so moist and I’m all for the chocolate PB cups. Glad your cleaning is all done – hope you have a great visit with your MIL! I’m not a huge beer person but I loveee pumpkin ale for some reason. 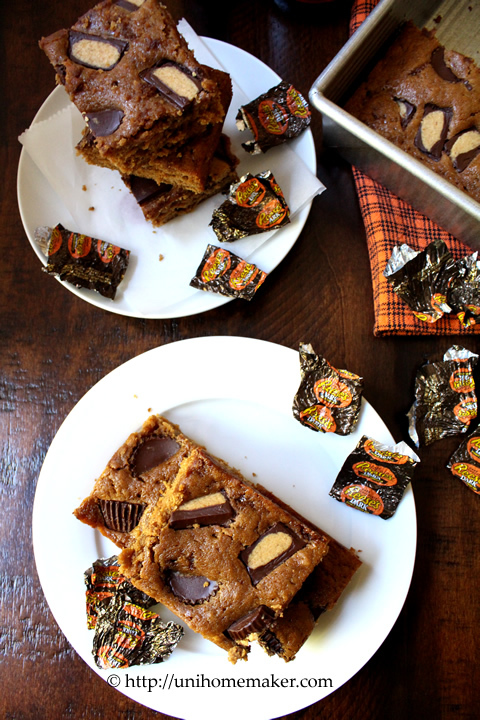 Probably the pumpkin : ) These blondies sound amazing – especially with those peanut butter cups! Sounds like you’re all set to have a great visit with your mother-in-law! Those look amazing! I love anything with beer in it so they sound perfect for me! Yummy! Pumpkin and peanut butter cups make such a great combination! Never had pumpkin ale before–will have to keep an eye out for it! Wicked combination Anne! 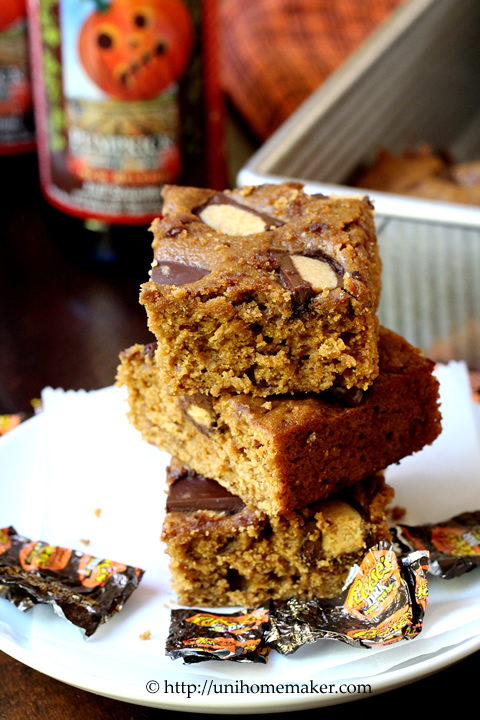 Love that you put your own spin on Blondies with pumpkin ale! The Reese’s Peanut Butter Cups kicks them up to the dream come true level. (Reese’s are my biggest weakness!) Thanks for sharing, girl. Pinning! These sound SO good. I wish i had a plate of ’em in front of me right now!! Have not tried pumpkin ale but it sounds yummy! This combination of pumpkin ale and peanut butter cups looks delicious! Wow – what an interesting combination of ingredients! I never thought of adding pumpkin ale to a dessert. I am intrigued! Pumpkin and peanut butter cups together?? What a revelation! It honestly never occurred to me to pair these two flavors but seeing them here now, they seem like natural partners. This opens up a whole new world for me, Anne, thank you! These look amazing… I love the combination of flavors… I have one bottle of Pumpkin Ale left and my favorite candy is PB cups… pinned! Have a great week. There is nothing like cleaning for an in-law visit! I hope you are able to get some much needed rest! As for these blondies? They look PERFECT. What a great way to celebrate fall! so I know we’ll be making these beauties very soon!!! Fantastic combination. Thank you for sharing. I am a HUGE blondie fan! These look amazing! I love that you used pumpkin ale in these Ann! I am a big fan of pumpkin and peanut butter! Delectable! Hope you’re enjoying your visit! These blondies look mad tasty! Glad you add PB cups, even if last minute, because they’re calling out to me. Have fun visiting with your mother in law! this looks delicious – and I’m all for pumpkin this time of year. such neat squares too! What a perfect Fall treat! Of course, I have to pin it to my Fall desserts recipe board. 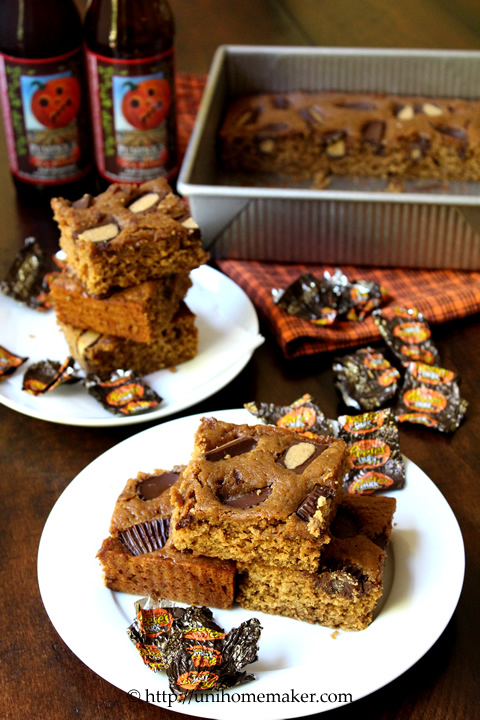 I am super into pumpkin ale these days, so these bars are a must make! Definitely the perfect reward after all the cleaning you’ve been doing! Oh my, the flavors you mixed in a bar anne! Too bad I can’t get pumpkin ale here, but I bet it’s good with another type of ale too. Maybe you can bribe someone into cooking and cleaning in exchange for a batch of these! We have some pumpkin ale on hand that we’ve been using for beer bread (well, I might have had a sip or two!). These look wonderful! We gotta try these – thanks so much. 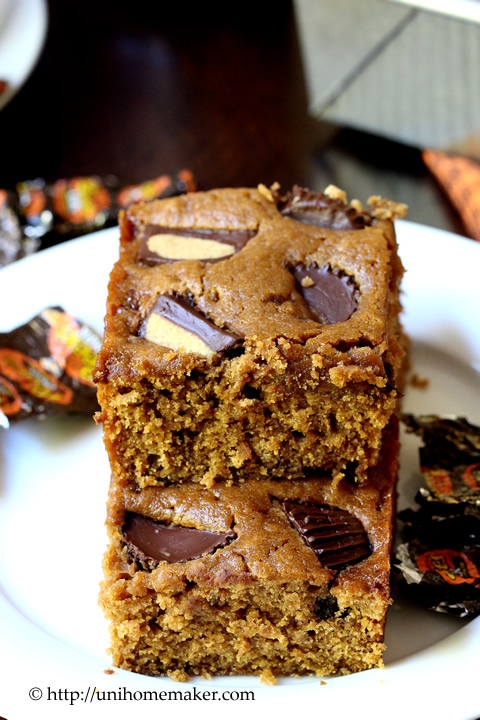 I never had pumpkin ale, I just imagine how tasty these blondies are with peanut butter cups…very tempting Anne. Oh wow! I can only imagine how wonderful these taste! I love recipes that call for a partial bottle of beer because that means I get to drink the rest of it while I cook and a half a bottle is about all I can drink anyways! These are so genius! Love it! These sound so good! I love Pumpkin Ale!